Spanning the Neuse River in East Raleigh, the dam is about a mile upstream of the old US-64/New Bern Avenue bridge. 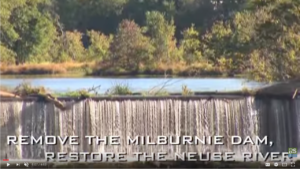 The Milburnie Dam is not the dam at the Milburnie Fish Club across Old Milburnie Road… the fish club dam and lake will be unaffected by the removal. https://milburniedam.com/wp-content/uploads/2017/11/RS-logo-340x156-300x138.png 0 0 admin https://milburniedam.com/wp-content/uploads/2017/11/RS-logo-340x156-300x138.png admin2011-10-20 11:00:352011-11-14 15:39:02Where is Milburnie Dam?